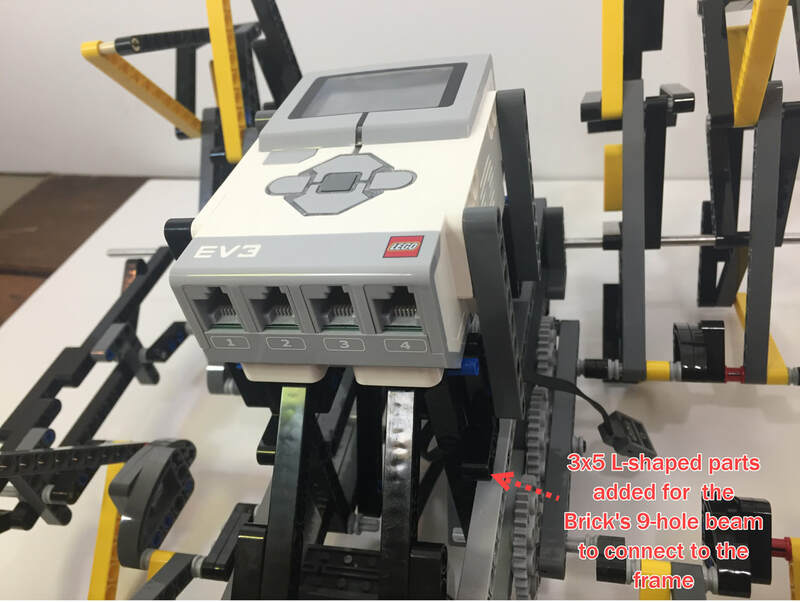 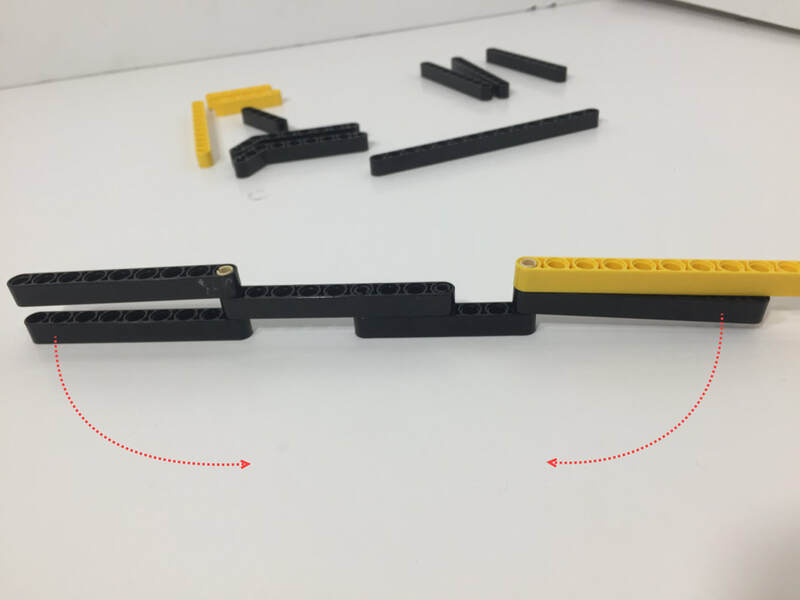 ​Below are the LEGO beam hole counts, which are 1 unit longer than the linkage's bar lengths simulated below. 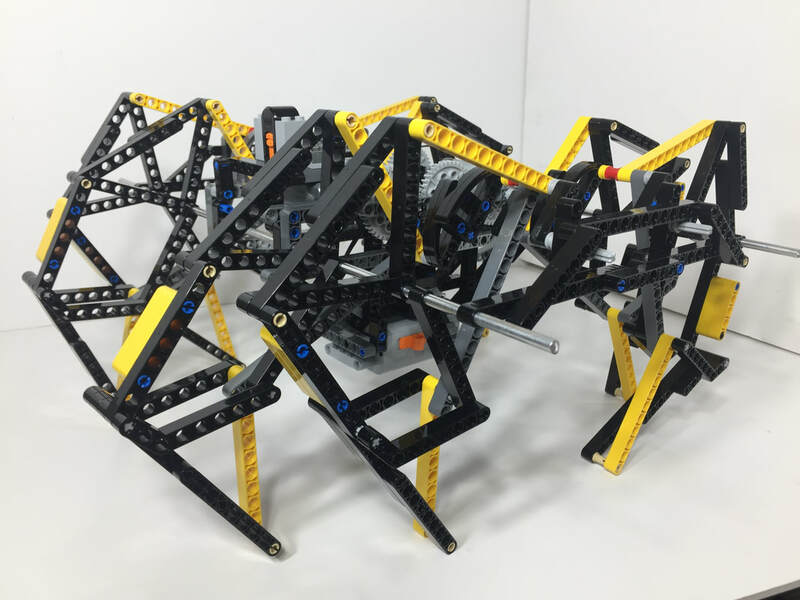 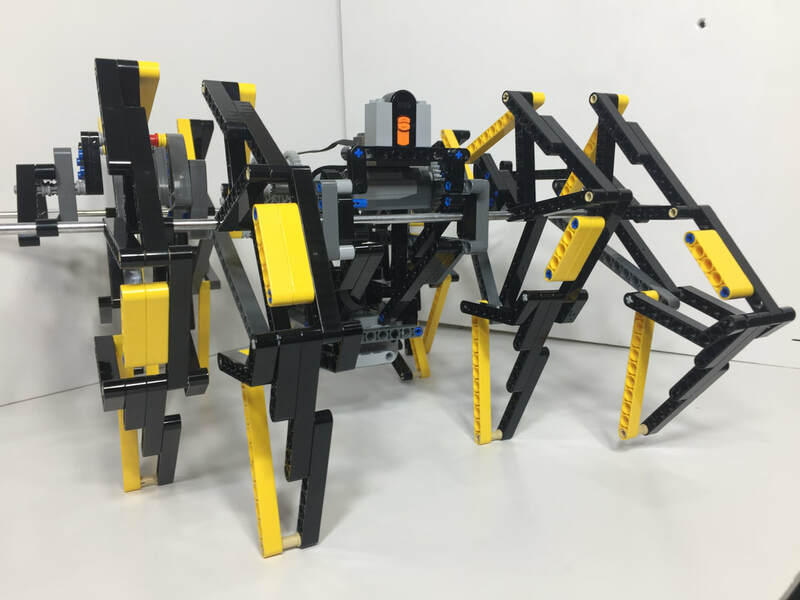 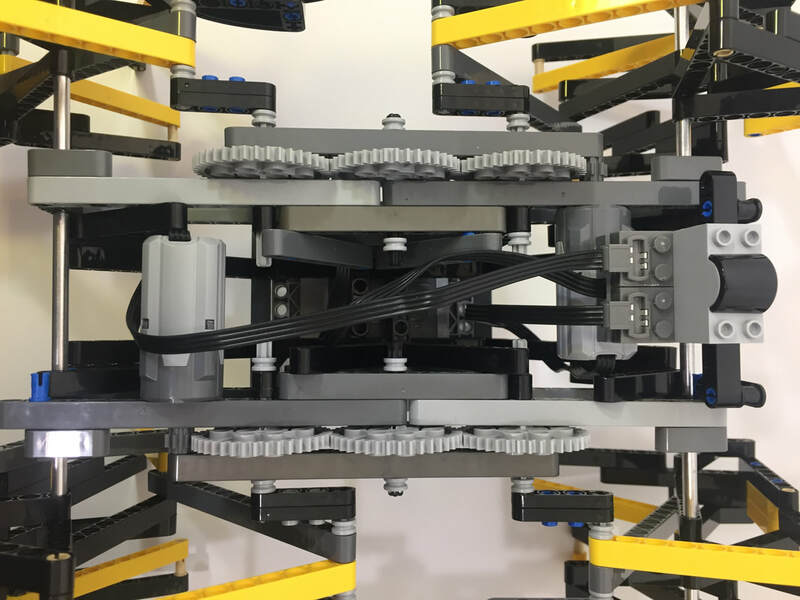 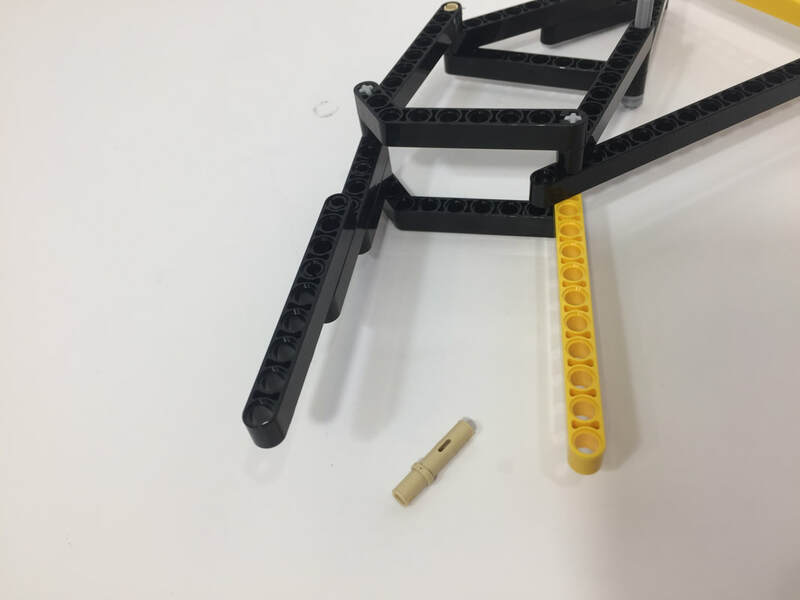 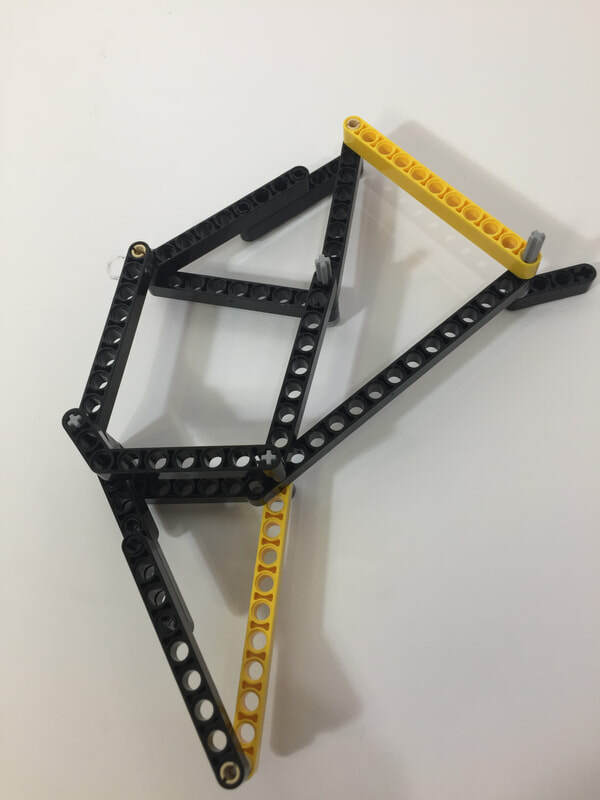 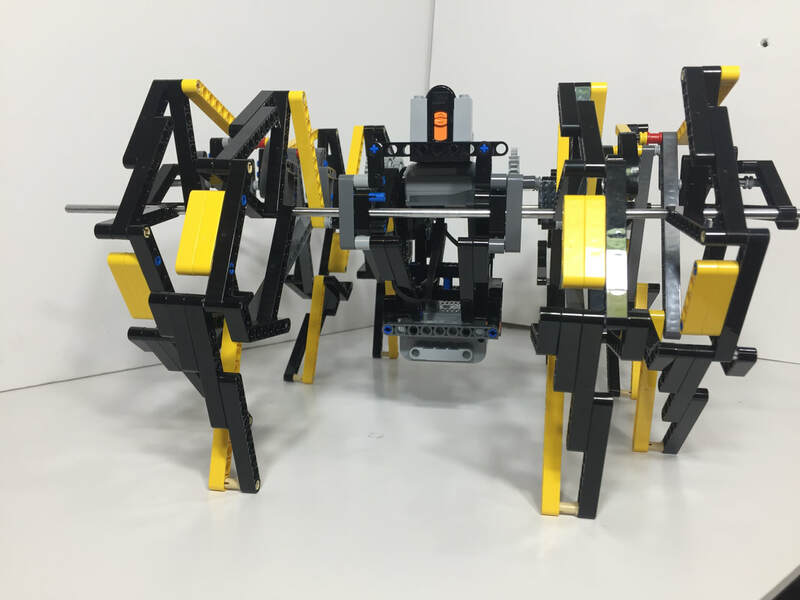 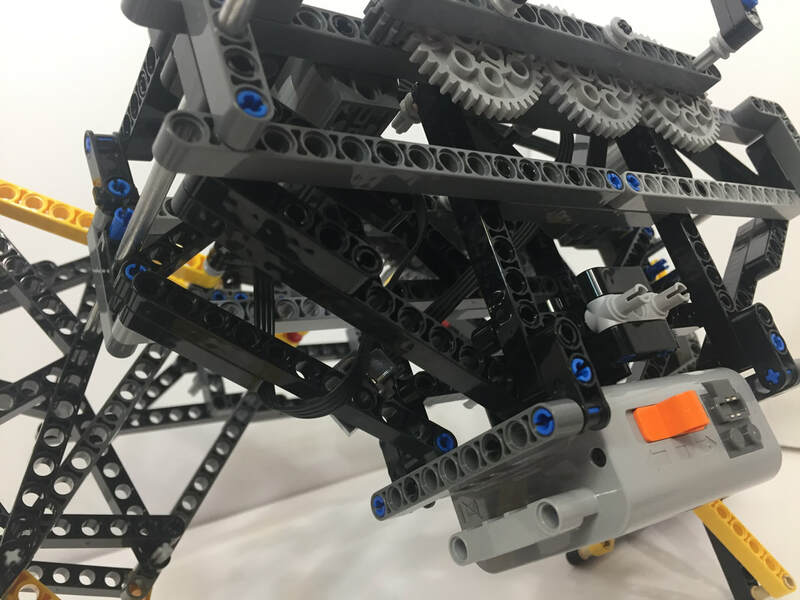 This LEGO approximation of Strandbeest was found with this Strandbeest optimizer for LEGO, where you can create your own version of the linkage, and find other approximations of Strandbeest. 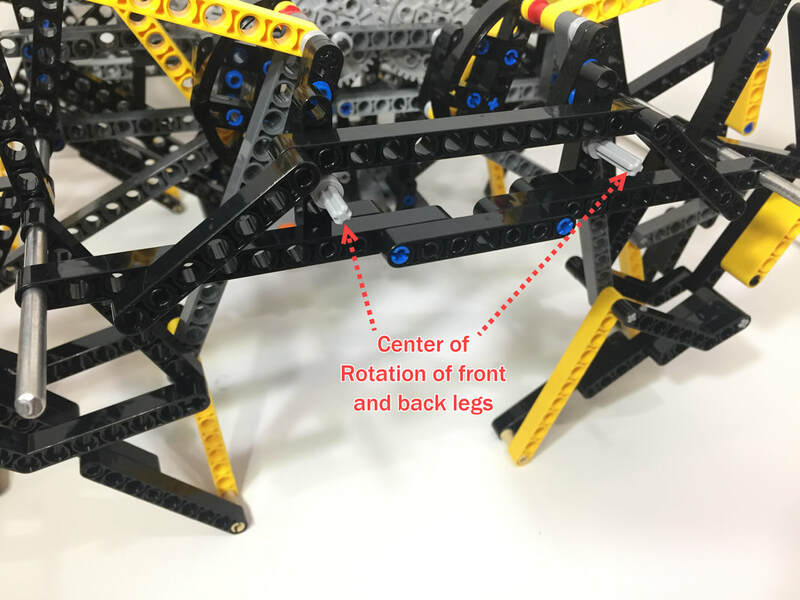 As shown below, Strandbeest's speed and turning can be smoothed by adding feet that slide or rotate described here. 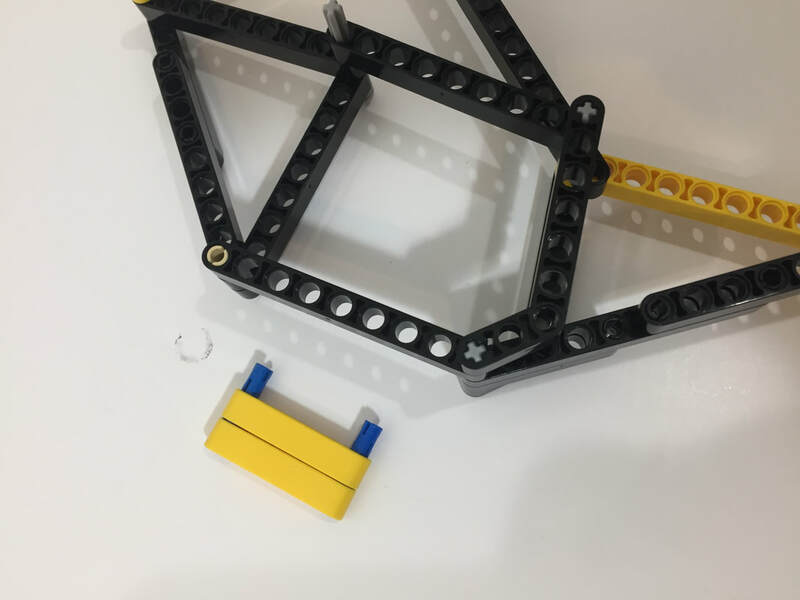 ​We'll try to get some step-by-step frame instructions up, but it can built a variety of ways as long as the the support rods are 2 holes below the crank's Center of Rotation, and 8 holes to the left or right. 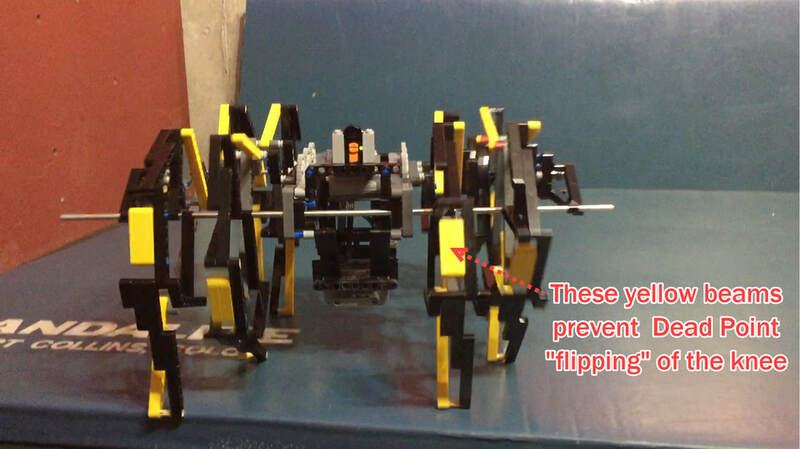 For now, below is the basic layout of each frame side. 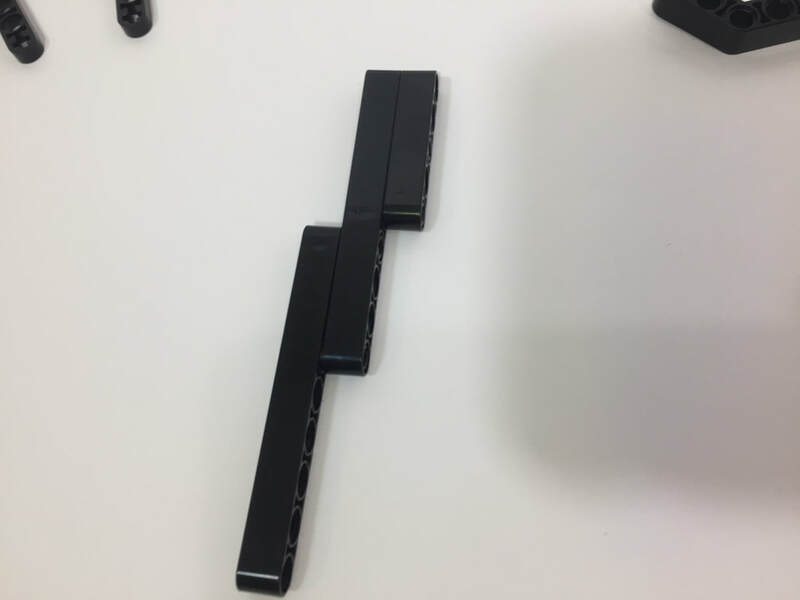 Both sides of the frame are the same, just flipped around. 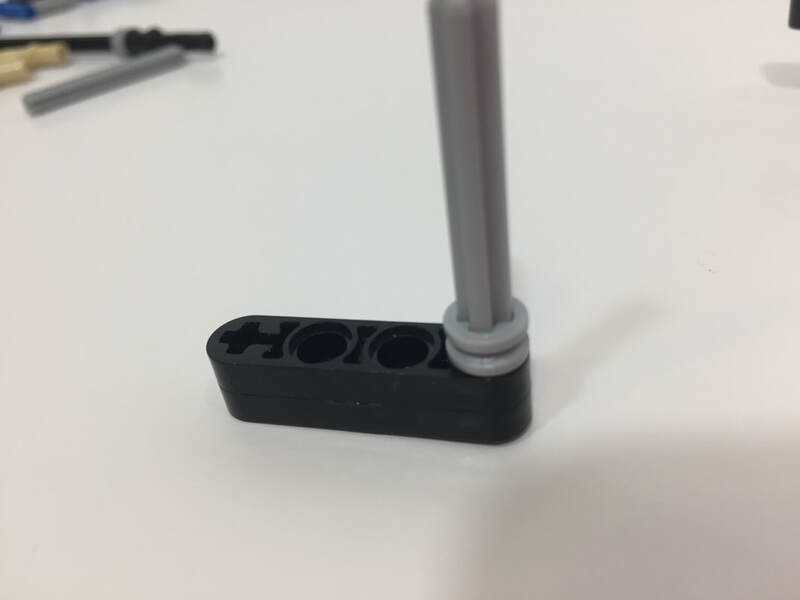 Step-by-step leg instructions are further down the page. 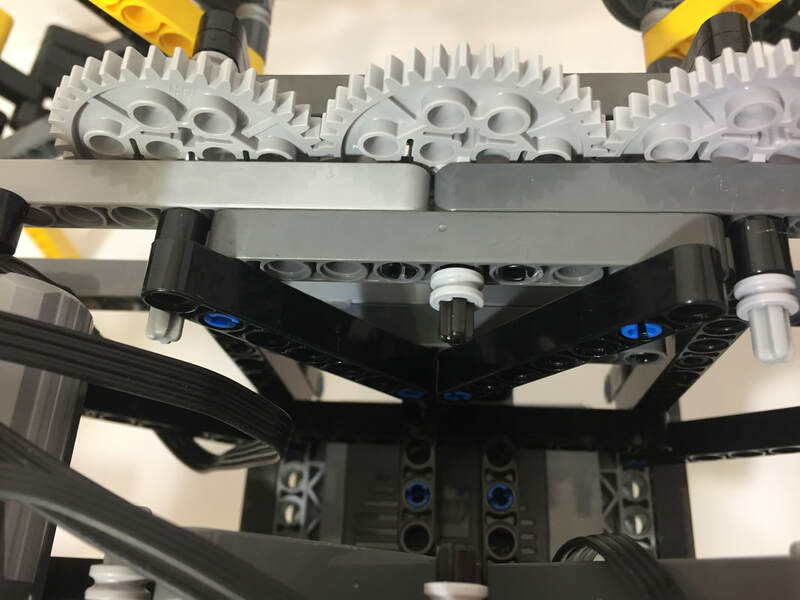 Note that each side's metal support rods pass thru 2 holes lower, and 8 holes to the left (or right) of its crank's center of rotation. 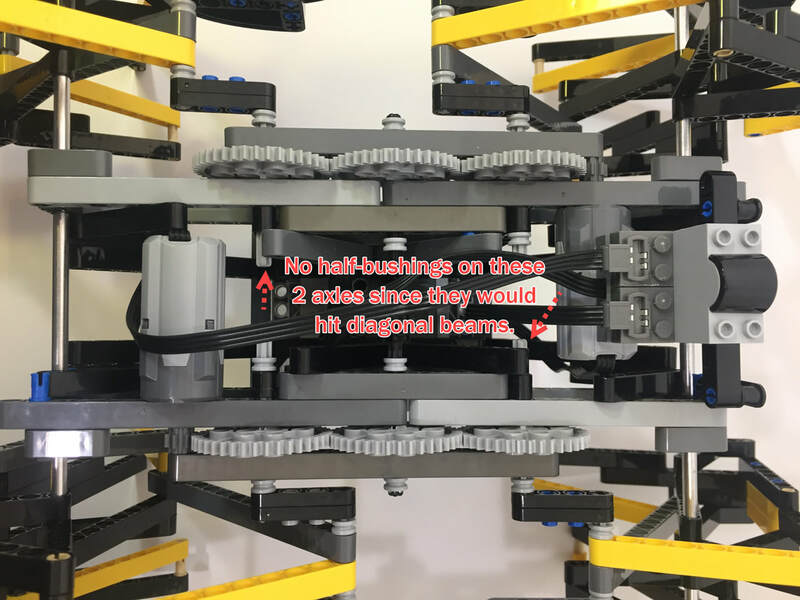 This required the upper and lower 15-hole beams on the left side of the image to protrude 1 hole out from the end of the frame. 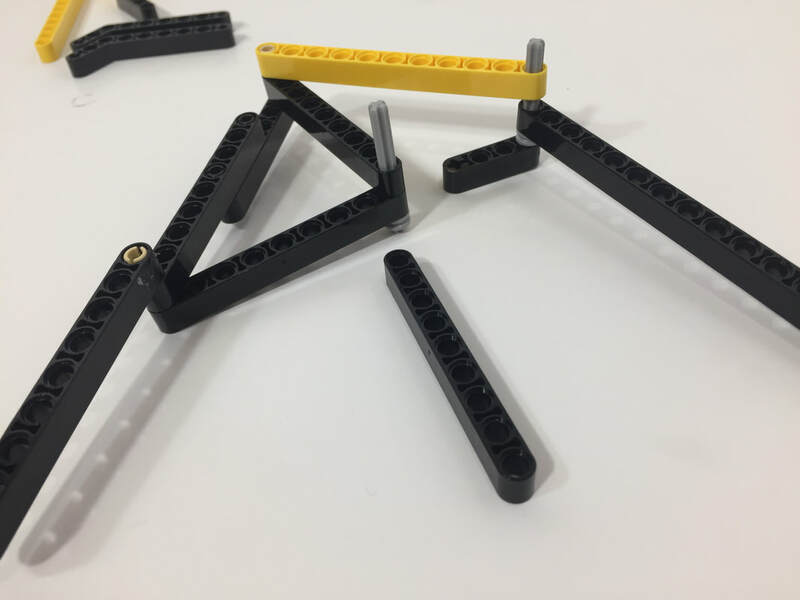 ​Frame triangles are critical for making strong frames for walkers, but LEGO's integer-based beam lengths can make it difficult to find diagonal beams of the correct length. 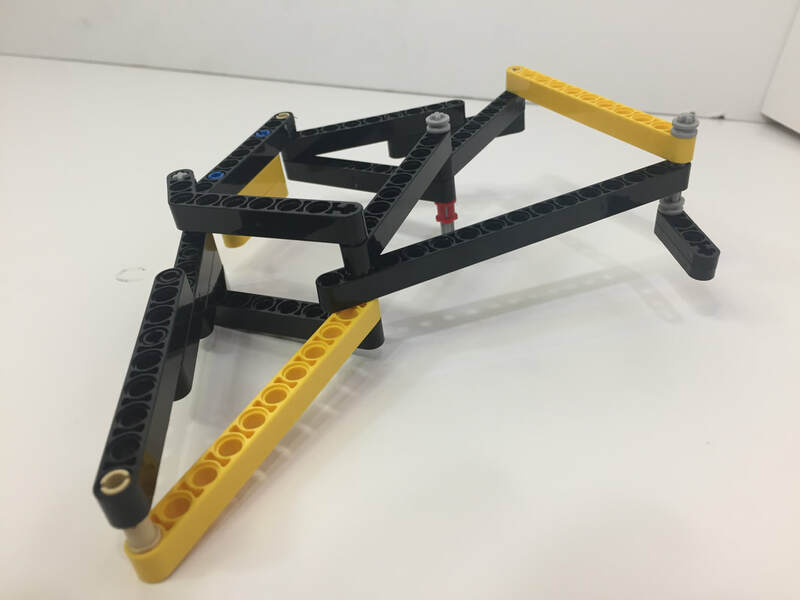 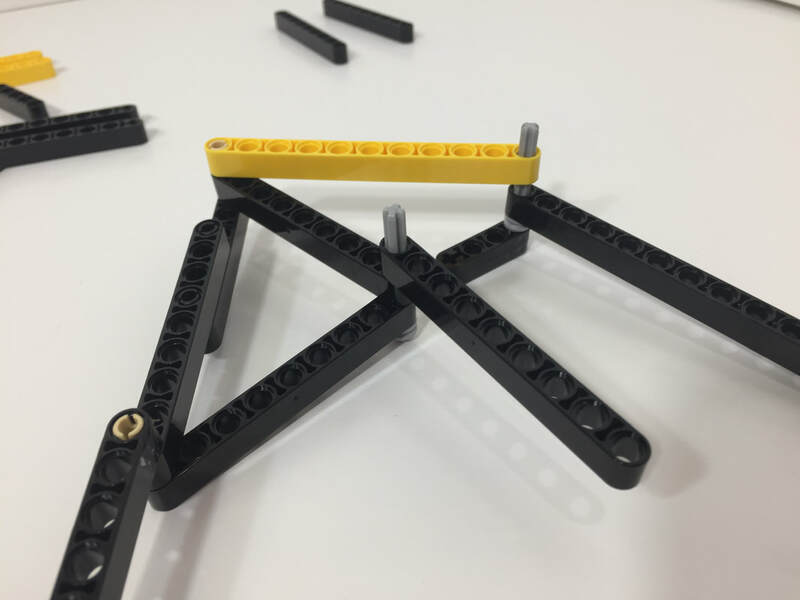 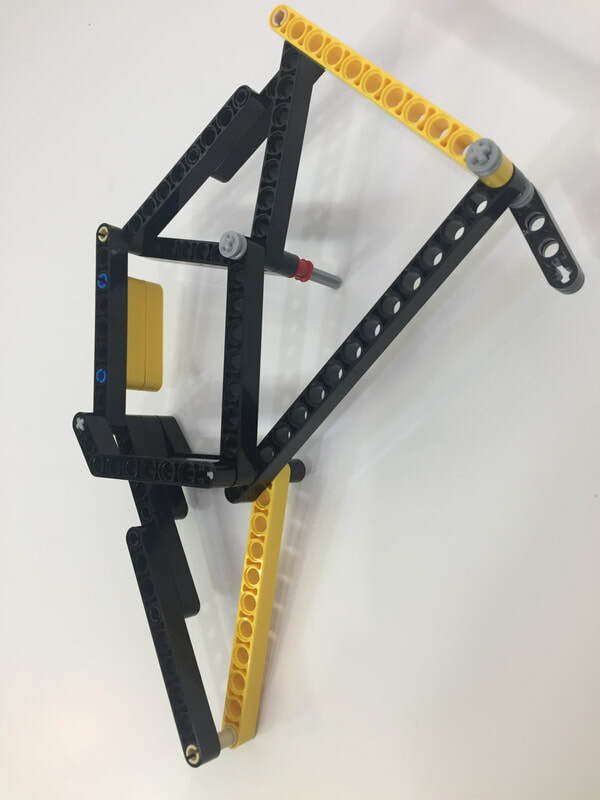 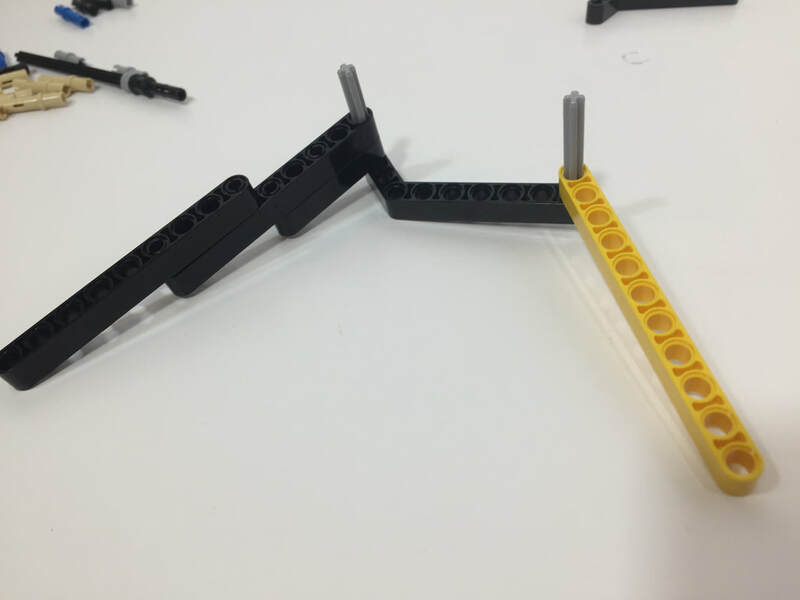 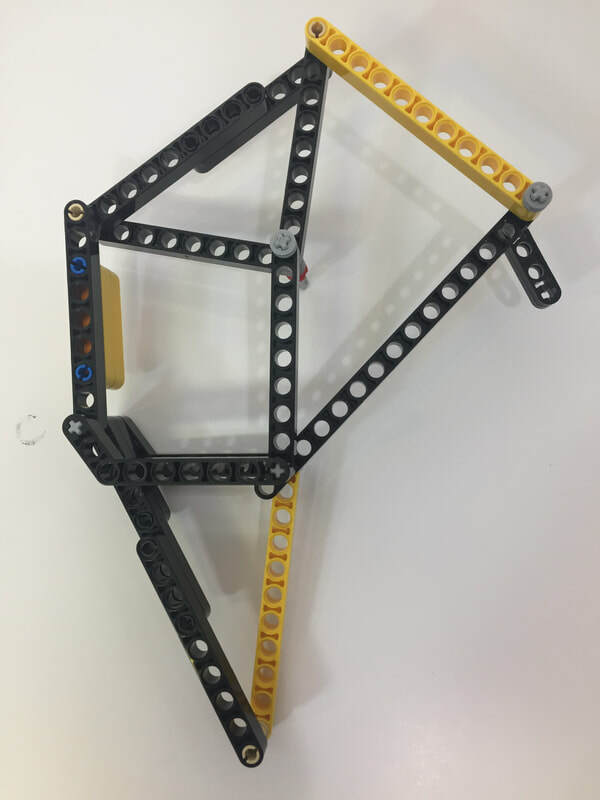 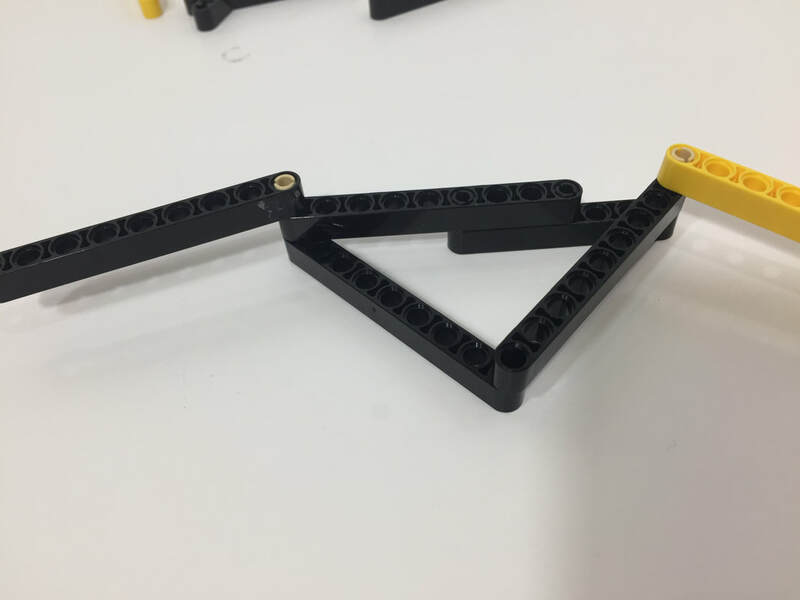 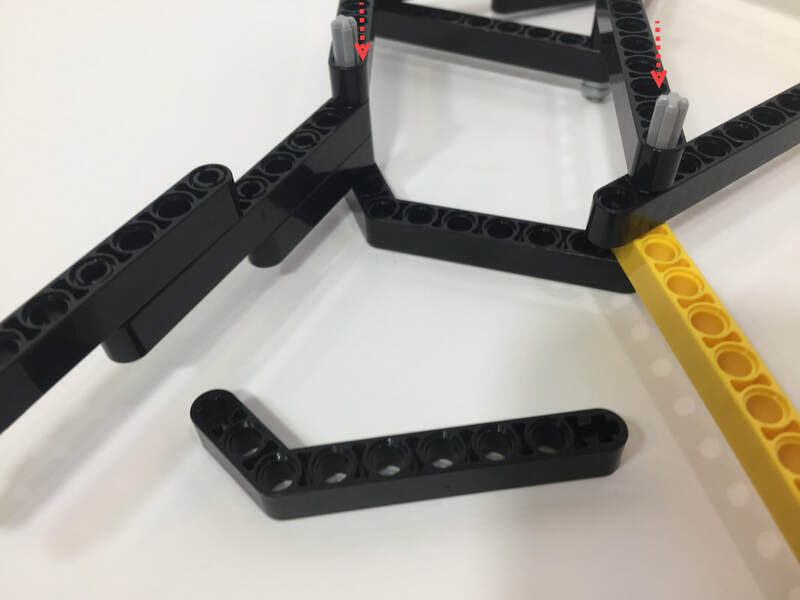 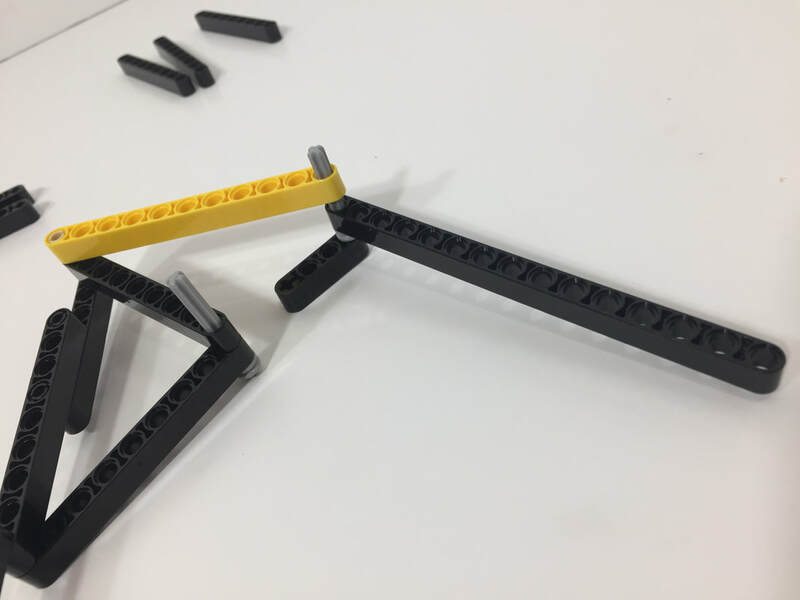 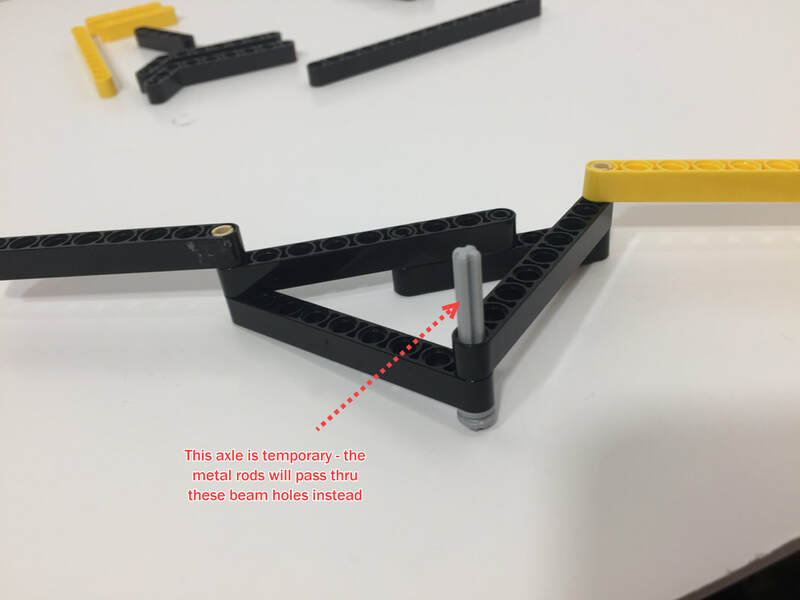 You can find other ideas for creating triangle-based frames with LEGO beams in this blog post. 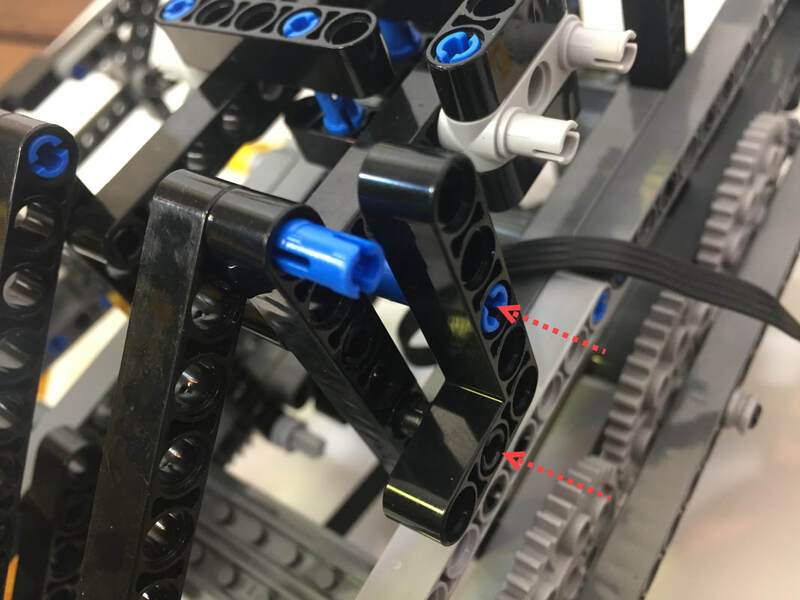 Be sure to add the below outer frame so that the outer axle is connected to the Center of Rotation! 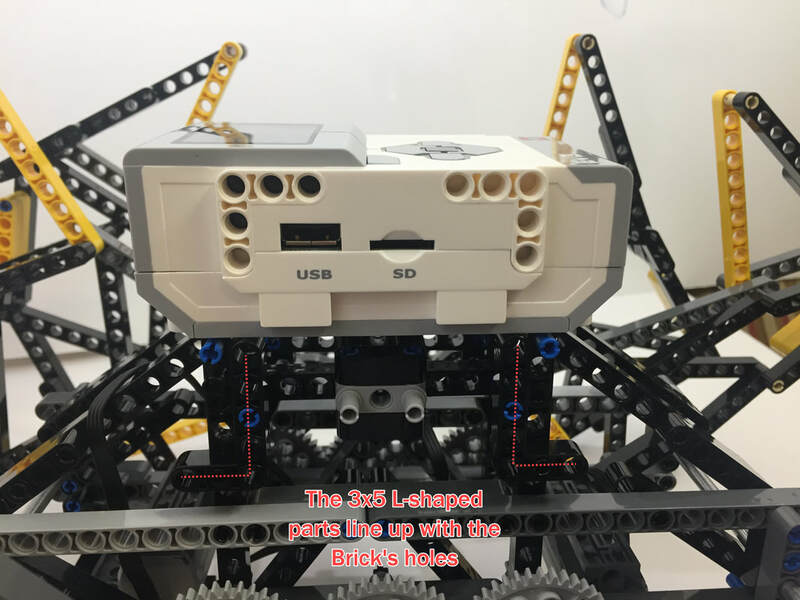 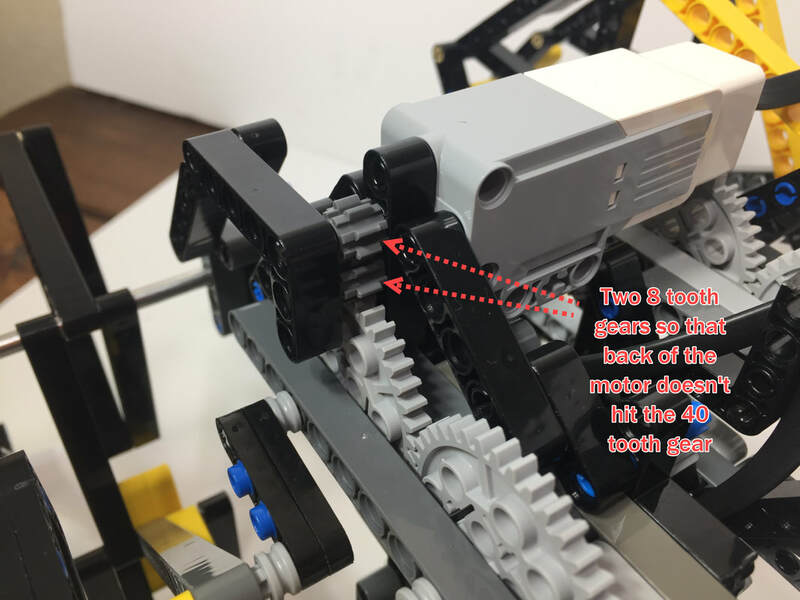 The Mindstorms medium motors are longer than LEGO's power function medium motors, so they had to be mounted on top of the 40 tooth gears. 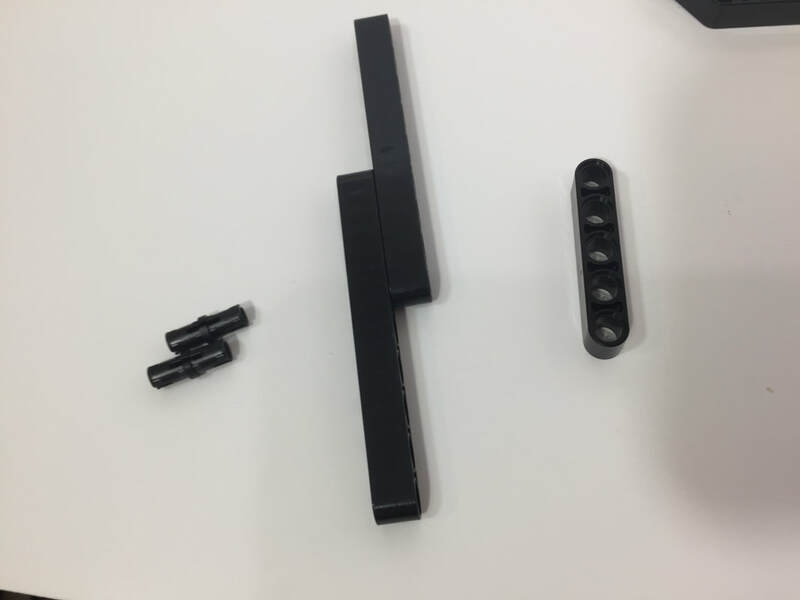 These are the parts used for the inner and outer cranks. 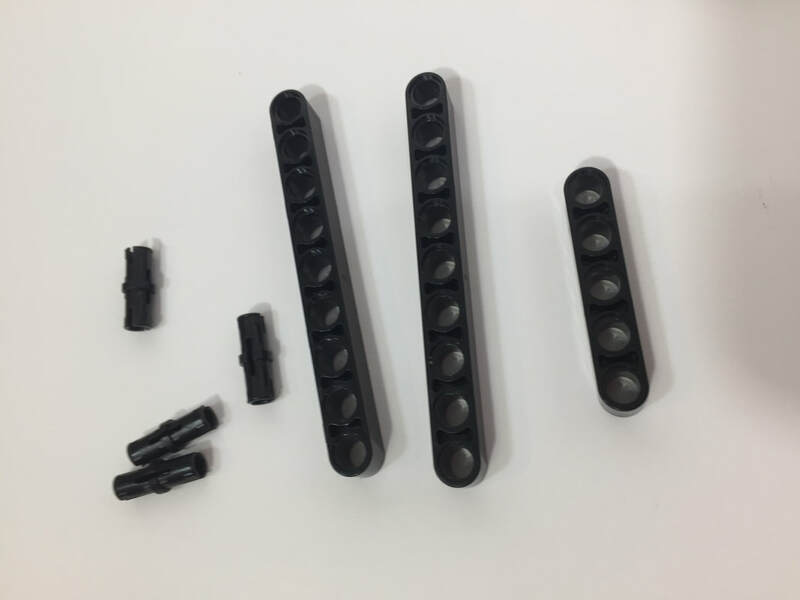 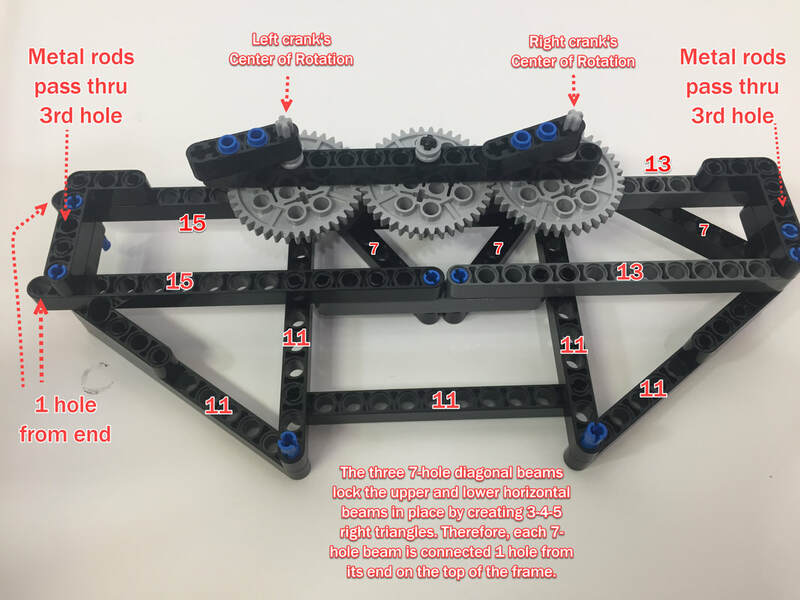 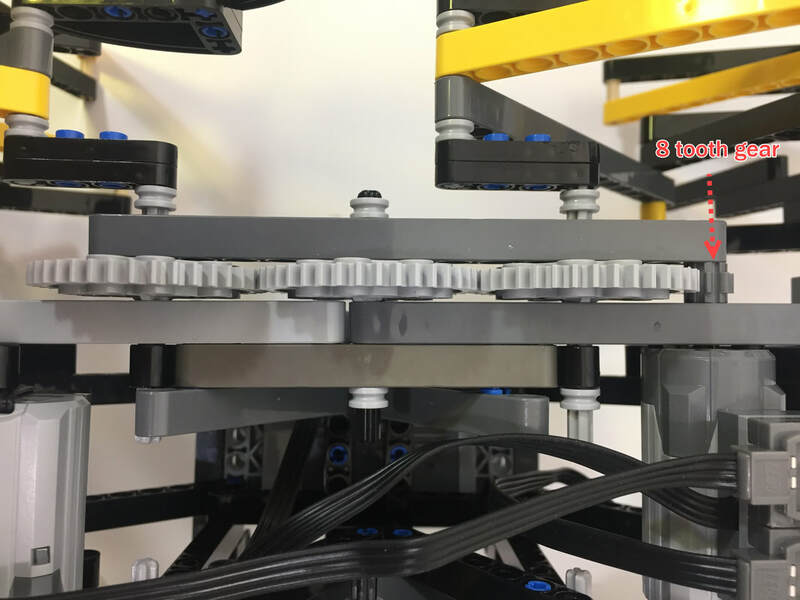 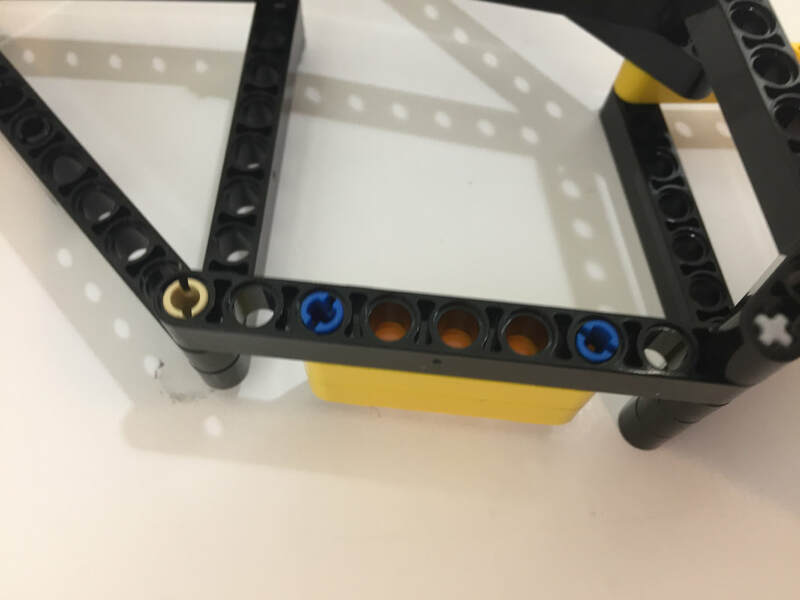 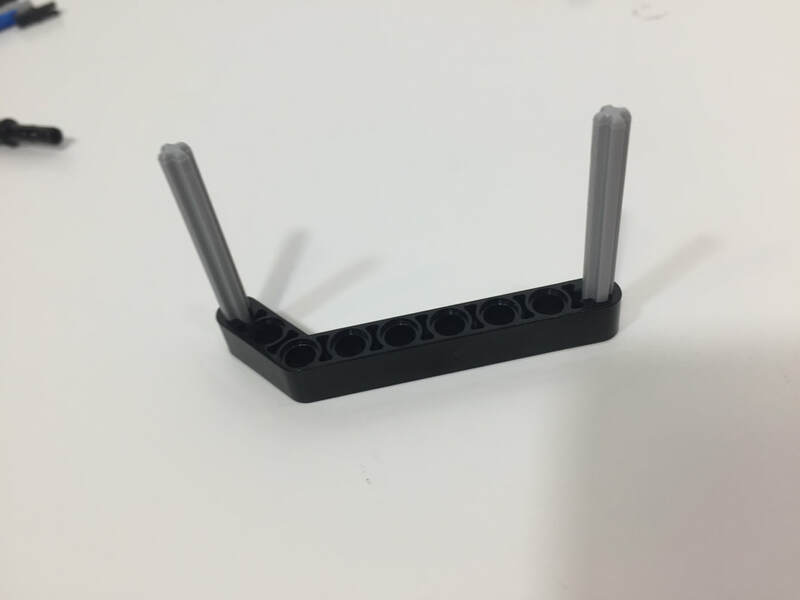 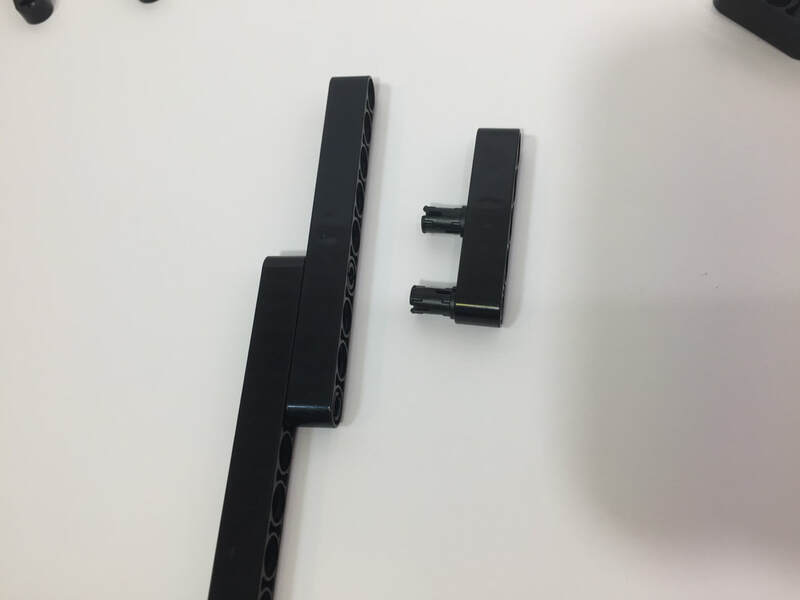 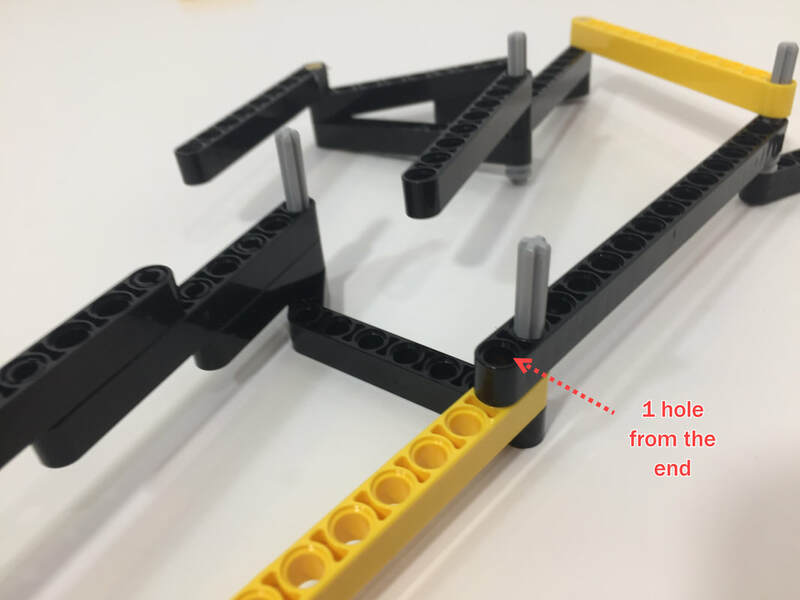 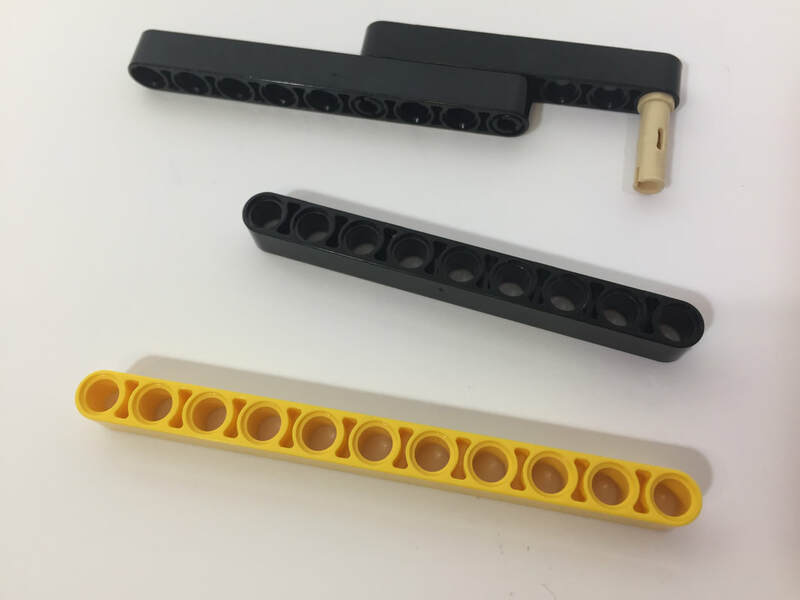 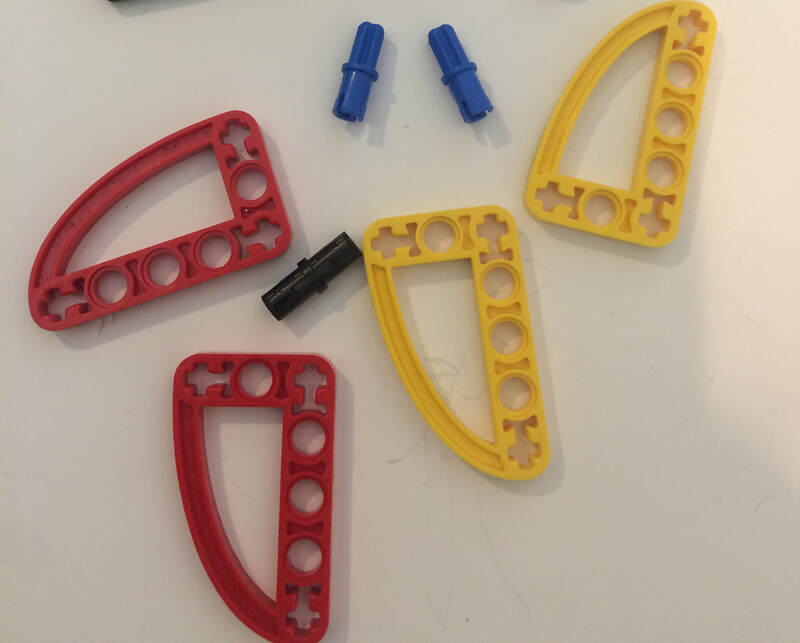 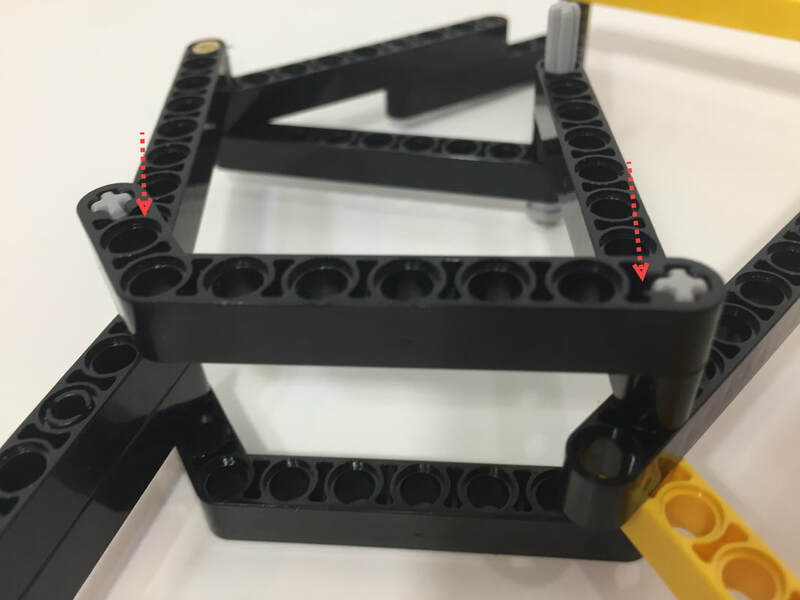 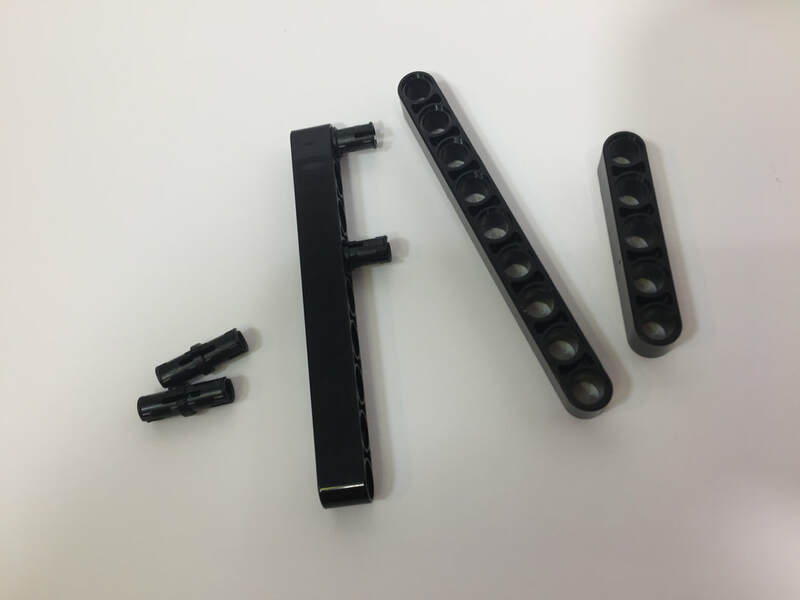 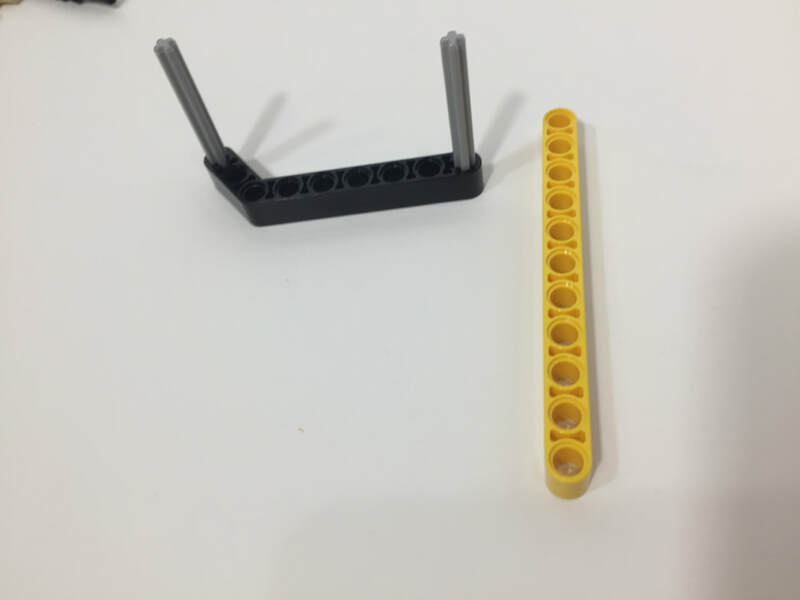 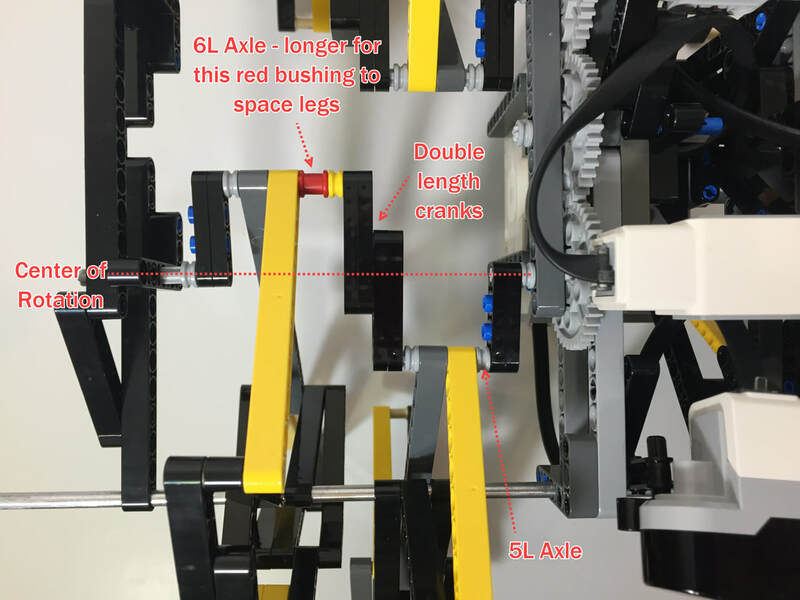 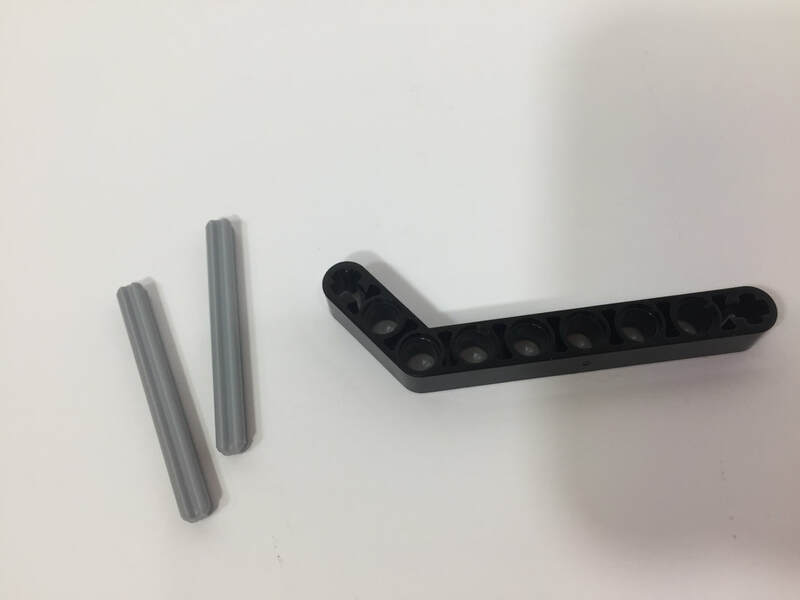 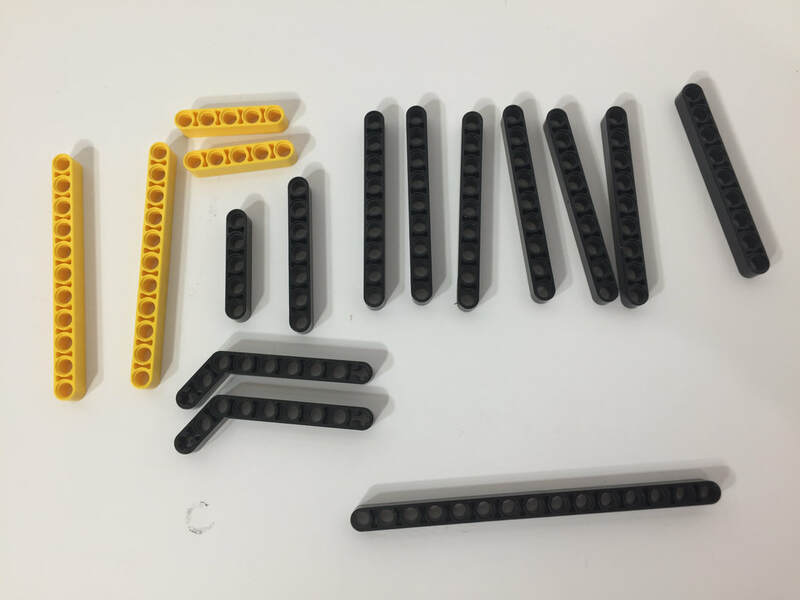 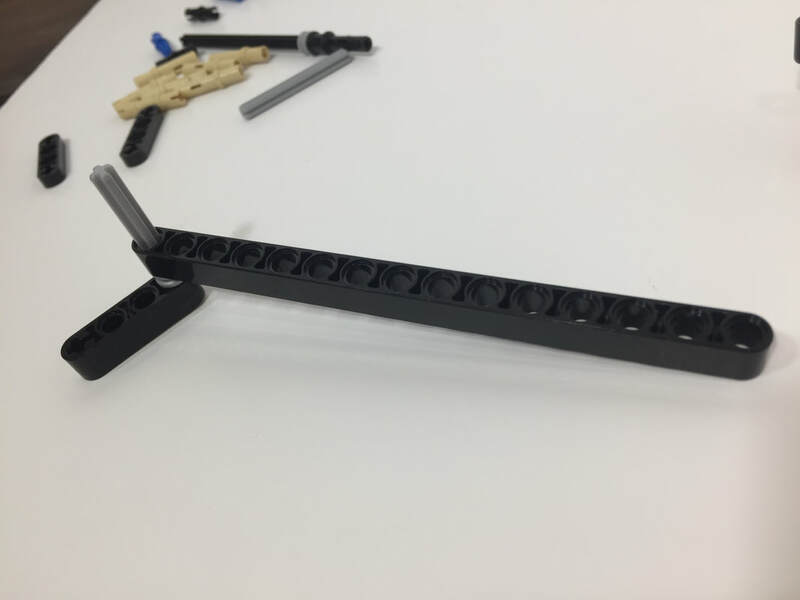 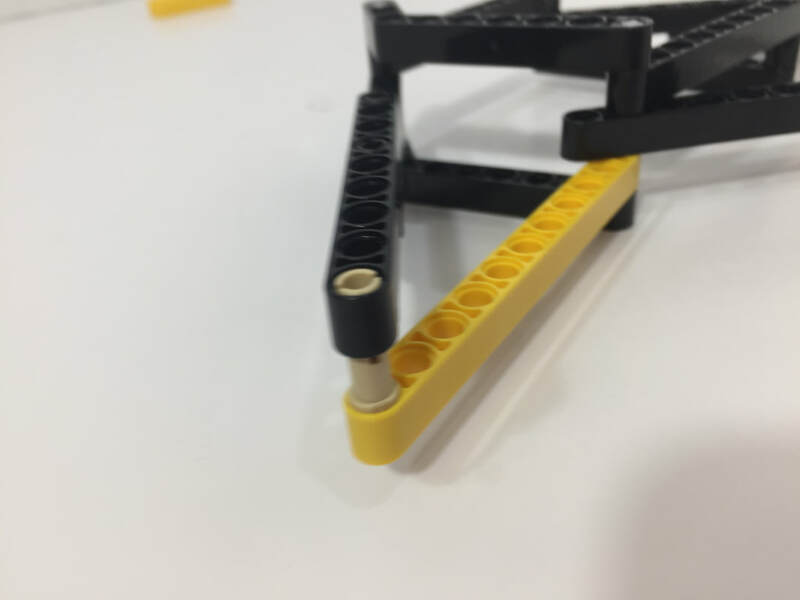 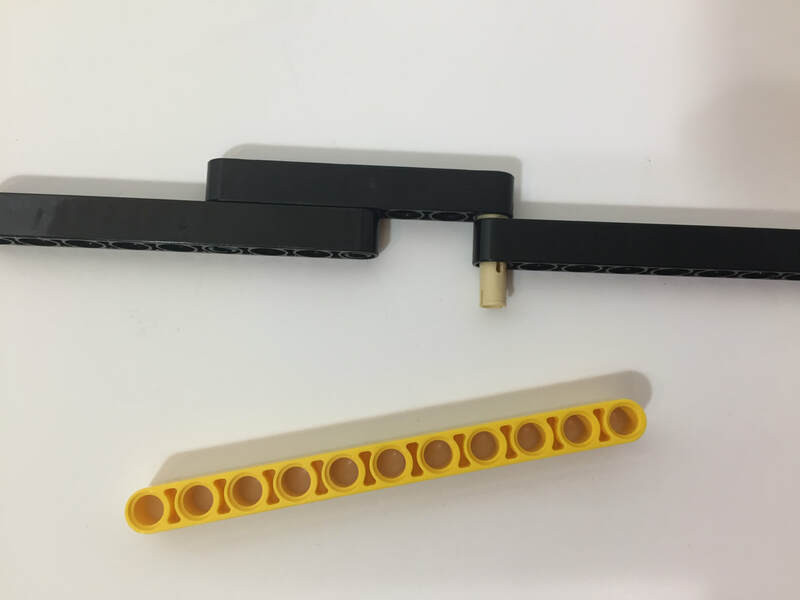 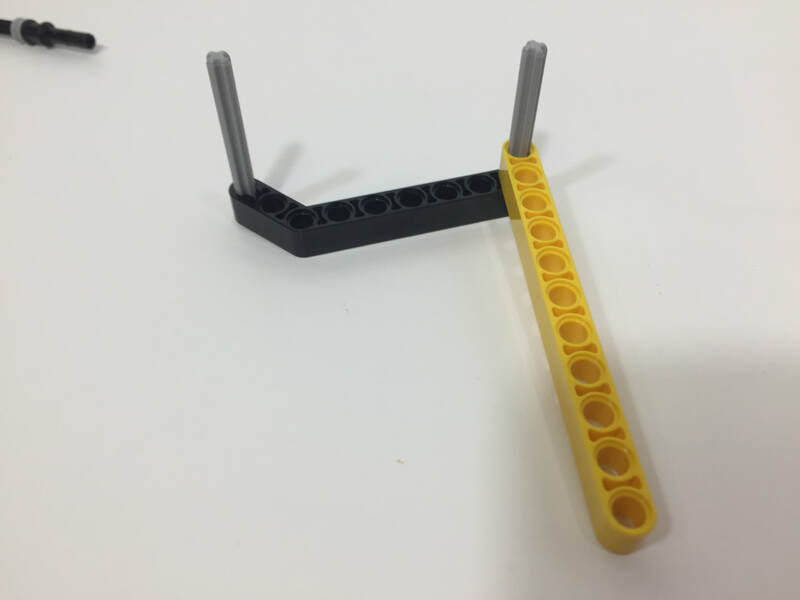 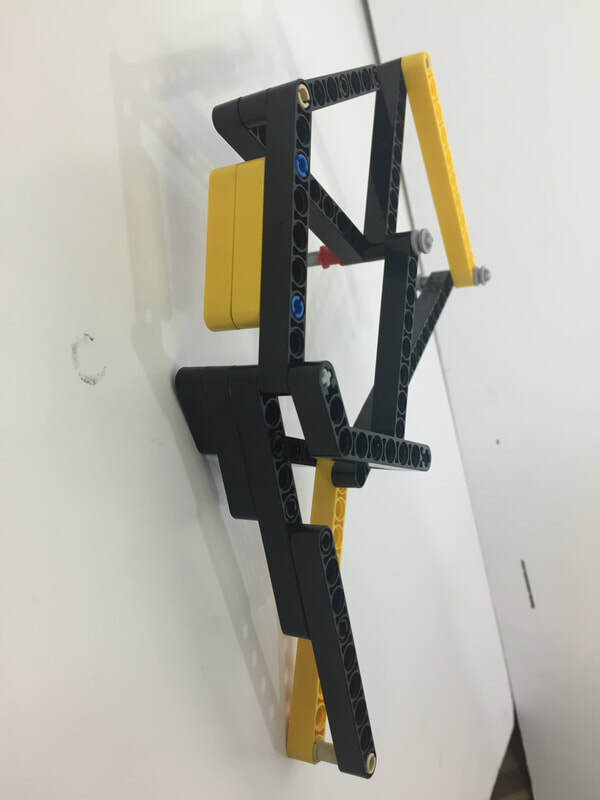 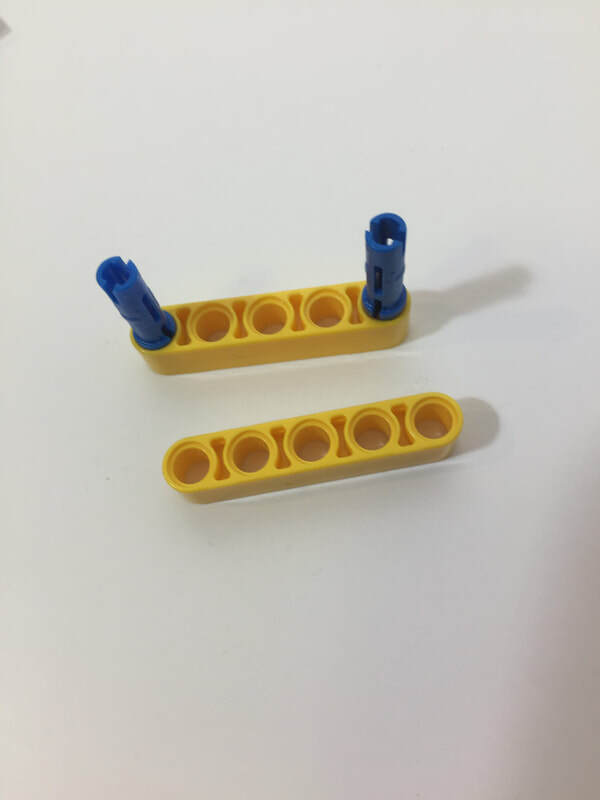 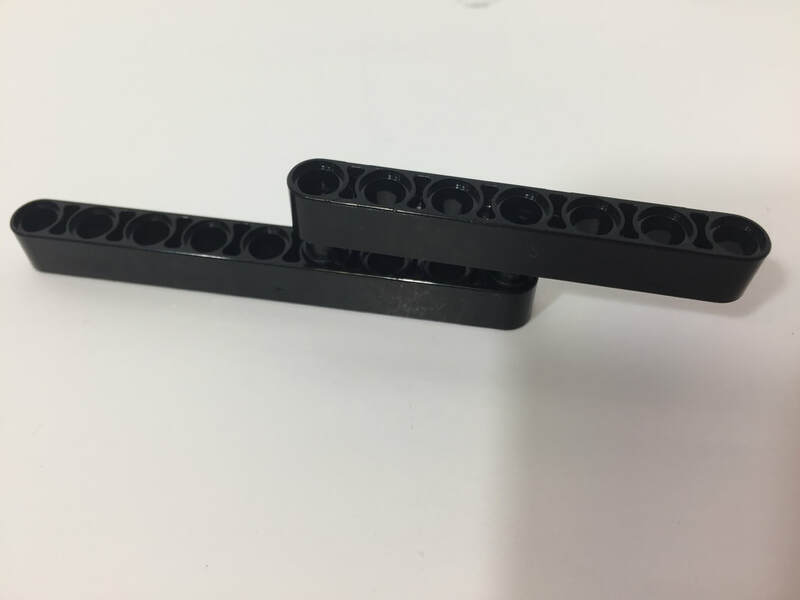 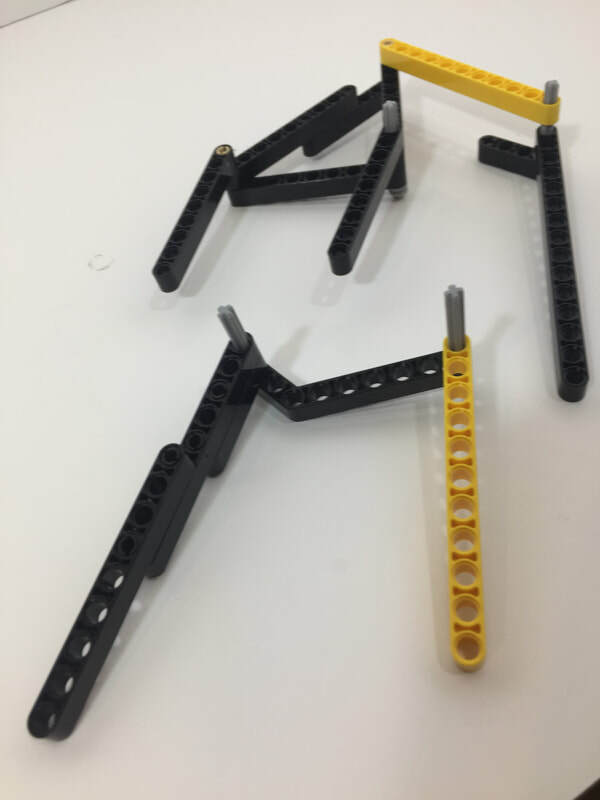 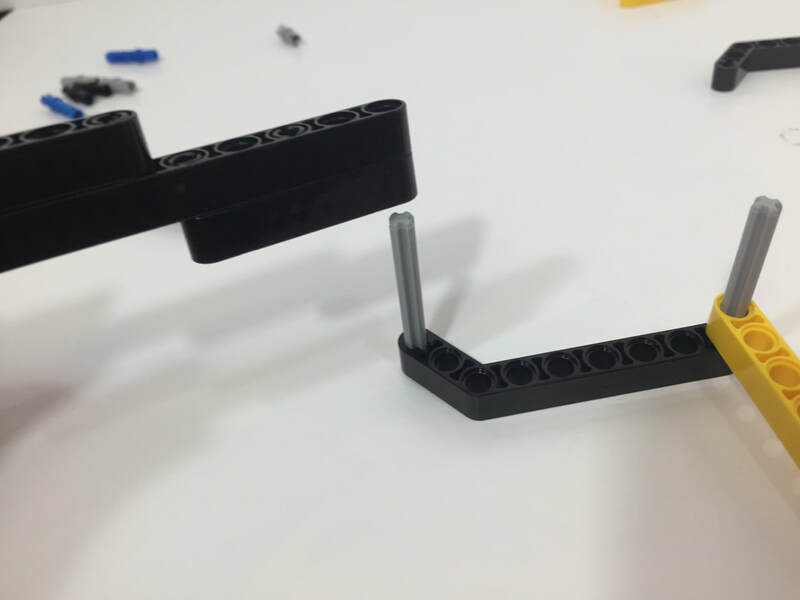 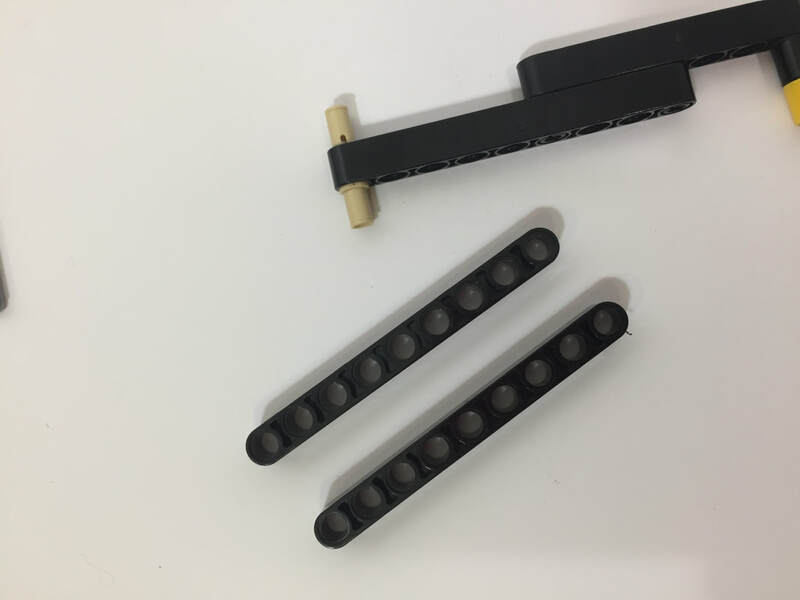 The four LEGO holes means the crank has a length of 3, so the center crank will need a length of 6 to put the outer legs 180 degrees out of phase of the inner legs. 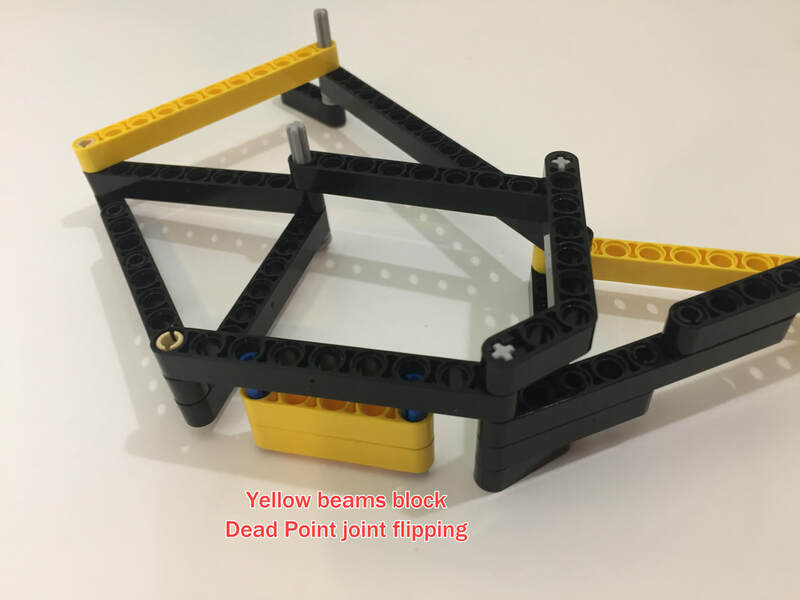 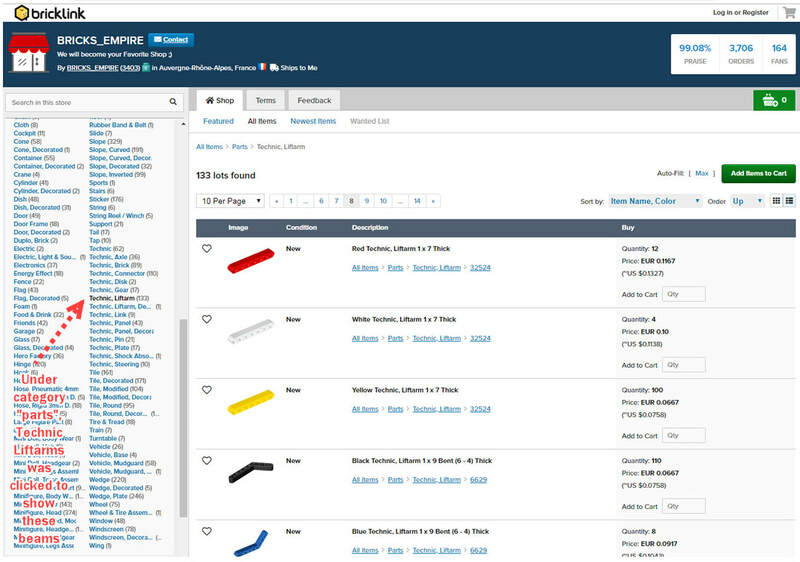 More ideas for managing Dead Points can be found here.